Lucky launches his most blatant attack against Michael yet, and the O’Briens visit Elvis Presley’s Graceland. There, Mary’s life is changed forever. Photo by Kevin Dooley, who takes some very cool photos, so check out his Flickr feed. This entry was posted in Chapter 11, HCWWPD by Christopher Gronlund. Bookmark the permalink. I was thinking, “maybe I should have my Mom listen to this podcast.” And then, this episode came up and I realized that it hits WAY too close to home for her to enjoy it. Still catching up on the last few episodes, but I’m having a great time with your podcast! Personally, what I’m enjoying most about this story is gradually learning more and more about the interesting characters and their histories. They’re so unique! I think the best road trip I ever took was when my family drove from Boise, Idaho, across to Seattle, then up the Al-Can highway all the way to Atlin, B.C. (the very northwest tip of the province). It was gorgeous scenery with tons of wildlife. Even though they call it a highway, a good bit of the road is just gravel, and there’s nothing around as far as you can see except trees. You know, I can’t actually pick a moment I enjoyed the most because everything flows so well and is so interconnected that I’ve enjoyed the whole thing in progression. If I had to pick just one tiny moment, it’d be when Michael gets his head caught in the door. I think his panic and his families panic are written so realistically. Right down to getting ashes in his eyes at such an important moment! Being from Scotland, I haven’t really done a lot of road trips. I used to get the bus pretty much from one end of the country to the other every weekend to see my then gifrlfriend (Now wife) Diane. It took a whopping 4 hours. Having built up a terrible fear of airports and their inevitable way of parting us I’ve really come to love traveling with her in the car as a sort of anti-airport. We’ve traveled frequently between Oregon and Idaho both with each other and friends. Even just the short trip there and back always gives me an incredibly potent feeling of content and luck to be with her. Hopefully next year we’ll be able to do a longer road trip. Perhaps even to Texas! Thank you! My grandmother (my mom’s mom) was a huge Elvis fan and some of the inspiration for Mary. 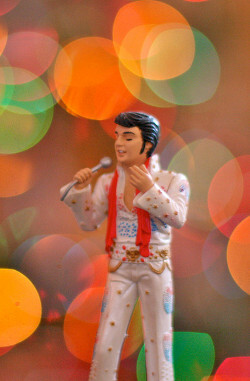 My mom is also a huge Elvis fan, so I like him be default. Still, for the sake of a story, sometimes you have to be very, very wrong! The trip into Canada sounds great! I’ve only been in Ontario, and not too deep in. So it was kind of like Minnesota…only in Canada. Road trips to Oregon sound great. Having had the opportunity to work there with a client, I fell in love with the state. I stayed in the Willamette Valley and knocked around the mountains, the coast, Corvalis, and Albany. Definitely a place where I could live. I’m glad you’re enjoying Hell Comes With Wood Paneled Doors and like the characters. It’s a straight-forward story, but it still makes me laugh and smile. The window scene is one of the few genuinely scary scenes in the story, so I’m glad you like it. Even the other things that would be terrifying in Hell Comes With Wood Paneled Doors are wrapped in humor. When I was younger, my sister’s hair got rolled up in the car window on a trip while she was asleep. When she woke up and was caught, she panicked. I’ve never traveled overseas; I can only imagine the long trek you’ve taken! A road trip in Scotland sounds nice. I have a good friend who rented a car in Ireland and drove around for weeks for his honeymoon. I’d love to drive around Ireland or Scotland. A road trip to Texas from Idaho would be a trek, but the scenery would be beautiful and varied. I’d love to head up to some of the national parks near Idaho. I’d also love to drive to Alaska one day.